Bob Cury at RJC Yachts sends in news of his recent appointment as central agent for sale of the 24.3m motor yacht Aquarius. 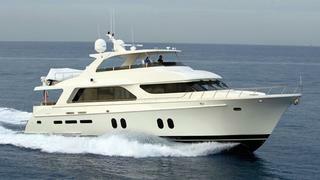 Built in 2008 by Cheoy Lee, she has three equally sized staterooms all, with private baths. Her contemporary interior is tastefully done in neutral tones accented with stone and granite throughout. Powered by reliable Caterpillar 3412's with extended warranty, Aquarius cruises comfortably at 20 knots. Additional amenities include full walk-around decks, large open aft deck and flybridge with built-in hardtop, wet bar, spacious seating and tender. The asking price is $2,895,000.